We always hear your face say everything. Your emotions on your face says everything. 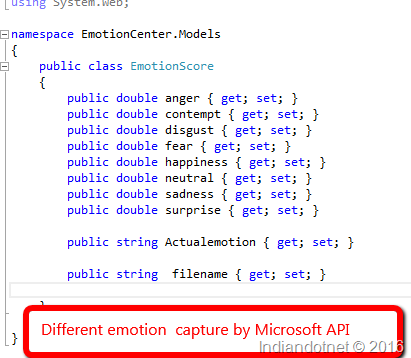 Microsoft’s did a great job to identify these expressions,these emotions with Microsoft Cognitive Service. Microsoft Cognitive service is an umbrella which has various APIs to help us intelligently. 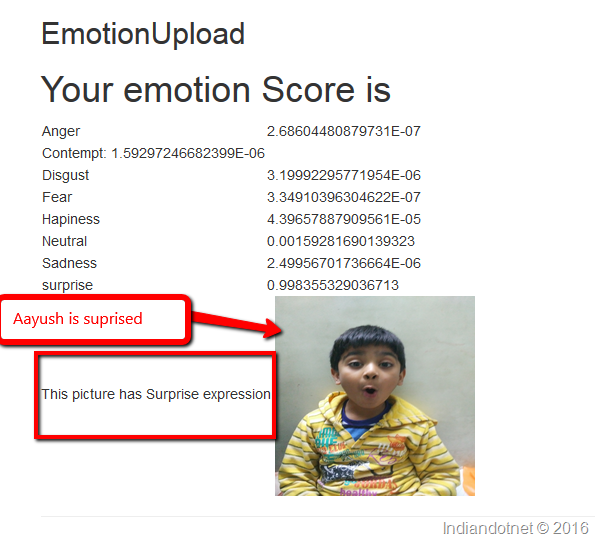 Emotion API is one of them to determine the the expression or emotion in a image. With the help of this Emotion service we can easily identify the emotion like happy, sad, fear,surprise etc. The best part of this API is that it detect all the faces in an image and provides the emotion collection object. Another good thing about this API is it is easy to use you just need to pass the image and rest other thing is handle by API itself. Now, I am very sure you are curious to know more and want to implement it at your end. I am trying to share basic steps how you can use this in your project. 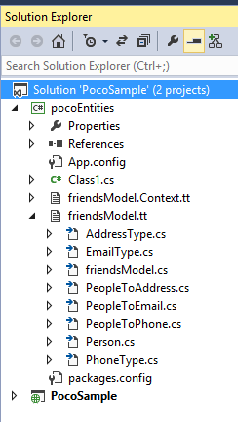 just wanted to share that I am using MVC C# in my example . Once you registered you can get the subscription key from my account. As you notice in the snap below in free trial we have 30,000 transaction per month & 20 per minutes API calling facility. Once you got the key the next step is implement it in your project. 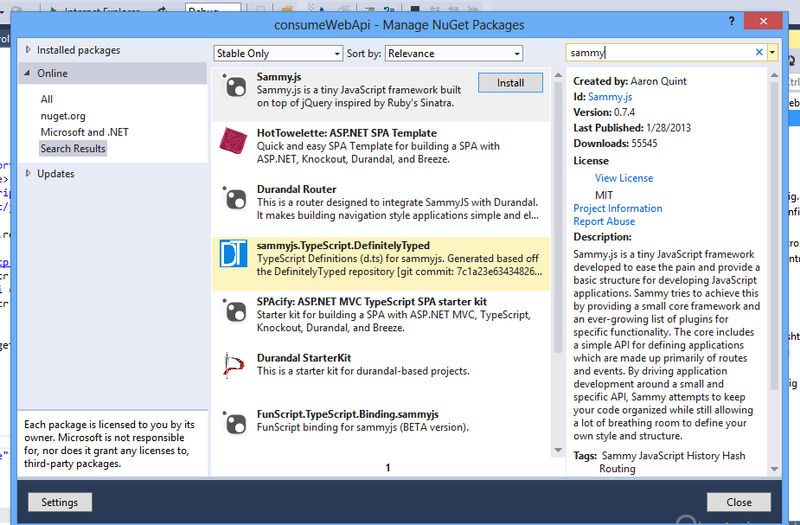 Step 2:- You can implement this via API URL or Nuget package manager in visual studio. 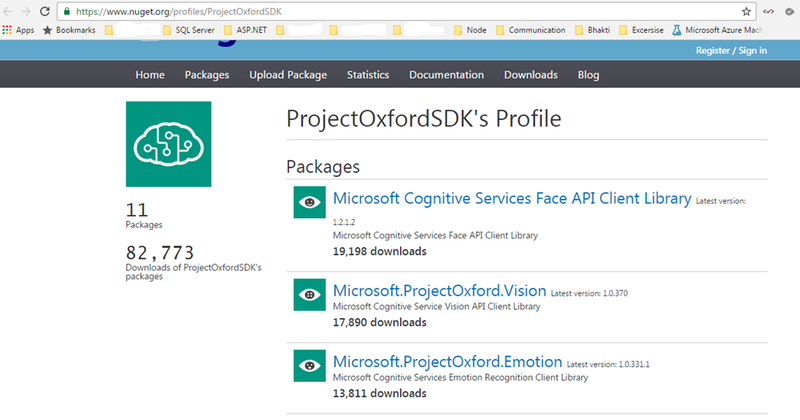 Just to update you that Microsoft’s Oxford team is working on this so the namespace name is Project oxford. 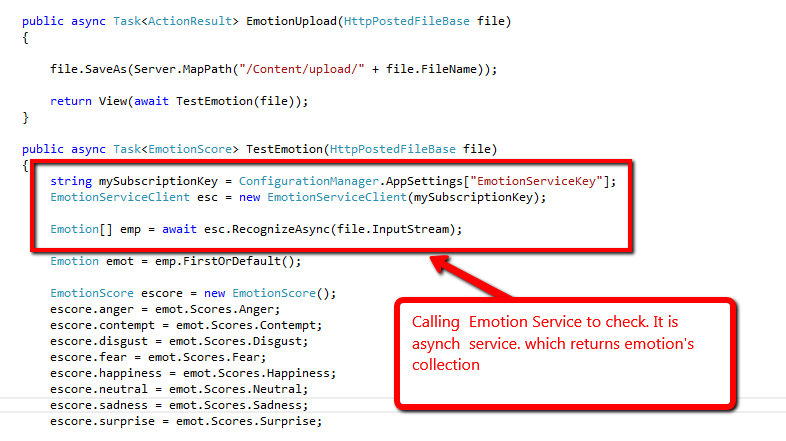 Step 3:- Once the Emotion package installed in your project simply create the object of Service API and call. Pass the image steam or required parameters as per the documentation. As you can see in below image, I have created a new object of EmotionServiceClient & passing subscription parameter to avail it. Once my object is Created, I am calling RecognizeAsync method in and passing the uploaded file stream. This Recognize Asynch method. The best part is it return Emotion’s array by determining the number of faces. but in current, code I am just interested in determining the emotion of single face. So, I did code accordingly. Step 4:- To capture all the emotion’s score I have created a EmotionScore class as you can see below. Step 5:- Once Everything setup just run the page and upload image.when you upload the image you will get emotion collection to play. See below snap in which I tried the same. I tried with several expression (Thanks to my little champ“Aayush” to help me out with his cute expressions). As mentioned above you can use API URL as well to call it. Please, feel free to share your inputs. and SQL SERVER 2016 CTP. Not needed to say that there are various awesome features in both build. 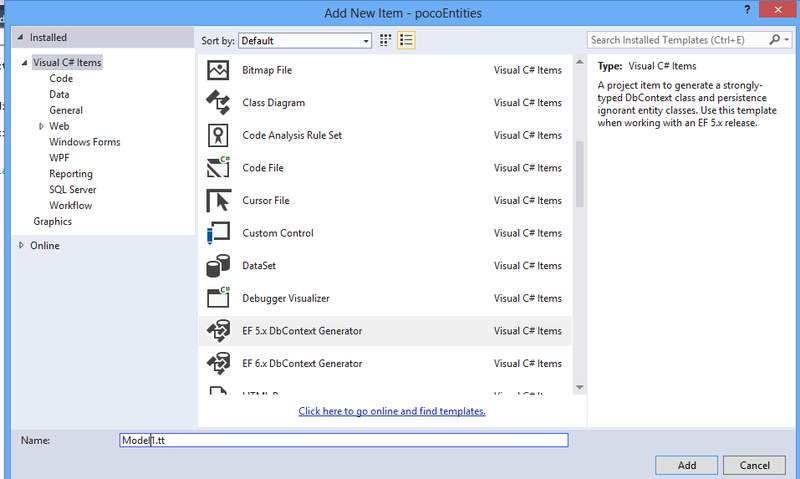 In future post you will be find tips & tricks related to SQL SERVER 2016 & Visual Studio 2015. Now a days a “ CSS pre processor “ is a very famous buzz word. Although I am a web developer but still I am not always interested in writing CSS don’t know why. When I heard about css pre processor then I was curious to know what it exact about. So let me share my thought here about CSS Preprocessor. 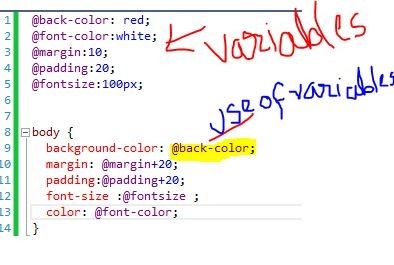 So a CSS pre processor is a way to extend the CSS language and variables, functions and programming stuff. As a developer you will be more happy to have pre processor because it allows you to write code and also reduce the amount of css up to some extent. 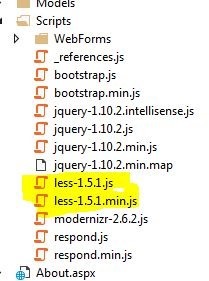 Now Let me share here how to use LESS.css in your ASP.NET code. Step 4: Now add a web page and write following lines to enable LESS css. Or you can add this from IIS. So we get the color according to variable which we declared. It means we can play with the variables and can write the less code in programming way. I hope this post will give a step to go further and I am sure you will deep dive in CSS pre processor soon. How easy to reduce efforts in retesting a asp.net web application? Most of the time when you write code for a web application you need to test it again and again. You have to run a whole flow of positive or negative test cases to check whether your application is working or not. Now suppose your application have 20 pages and you need to traverse each individual page and may be perform some operation and on each change of your development you need to perform same thing. sometimes, this thing will irritate you and you will skip testing which may be harmful because most of the time it happens when you skipped something you took a deep breath and at that moment your application crashed . So , as a responsible developer we do not have to skip any test scenario but next question is how to reduce this effort which you feel boring sometime. The basic concept of this tool is what ever you will run in browser it has capability of recording those steps so it is just play button and pause button game, no rocket science. You can easily run and use this. I am sure it will reduce your testing effort and when when selenium ide will play your test cases you can take a deep breath and enjoy your coffee and snacks. I hope this tip may be helpful to you somewhere. Thanks for attending session on 30th Nov 2014. I would like to say a big thanks to Abhishek Sapkale also who delivered the session and share knowledge with us. We tried to do go live in this seminar and some people joined also and enjoyed the live streaming. I hope it might help you. Today I am sharing with you one of the best and easy to understand JS which is “Sammy.Js”. “Sammy.js” is 16 k java script over JQUERY which provide facility to developer to create RESTFUL SPAs (single Page Application). You get Restful URL easily with this. Let us understand this with example. Here I am using the sample source code to move forward with sammy.js. We have define $.sammy function which is bounded with the div whose. Step 8:- Now to which url we need to entertain by which method like get, put, Post, delete. We need to define our functionality according to our need in current example we have used get function. I hope this example will help you to create your own SPA application. I defiantly say here “Sammy.js” rock. I like this script hope you will also. 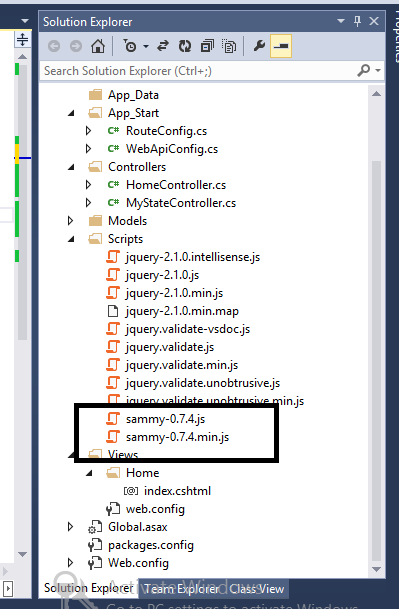 How to consume Web API using JQUERY ? Now next is how to consume it ? So here we will understand this by an example. 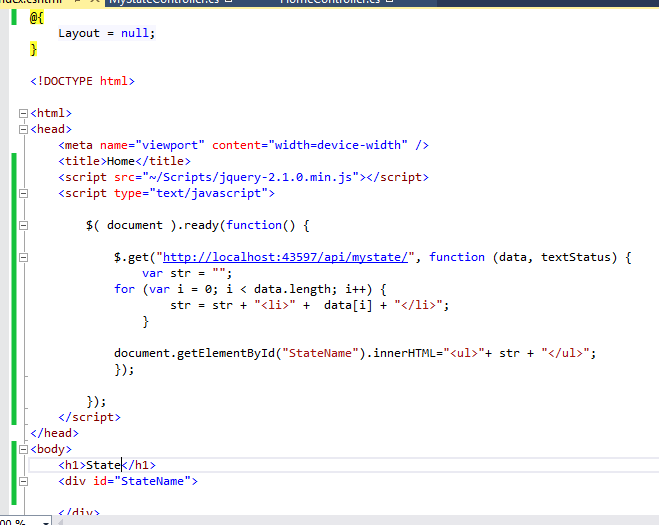 I am pretty much sure you all are comfortable with server side code so here in current example we using client side code to consume web API. 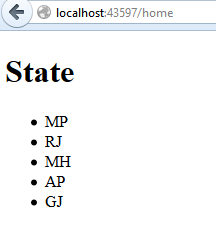 In current example I have created a Web API with name “MyState” . 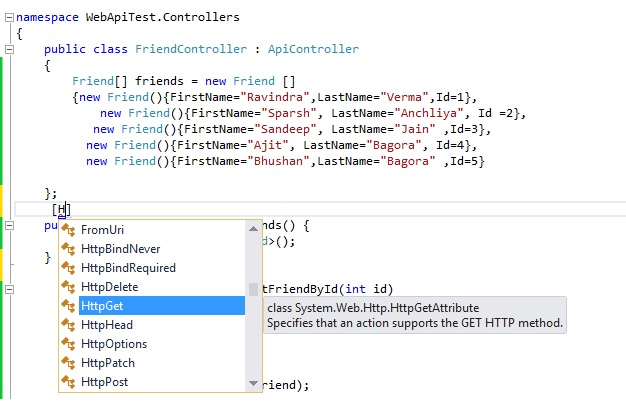 The basic functionality of this Web API is to provide list of all the State with default get method and provide specific state according to provided id. I hope you will like this post. 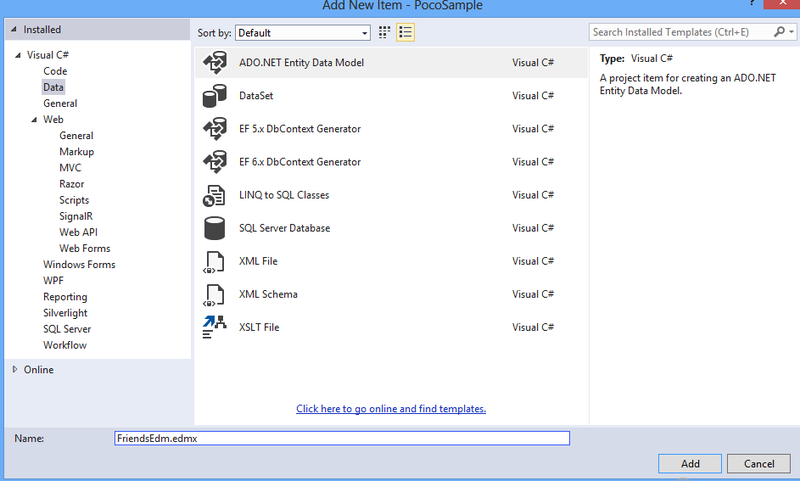 Step 1:- Add a Ado.NET Entity Data Model as shown below. 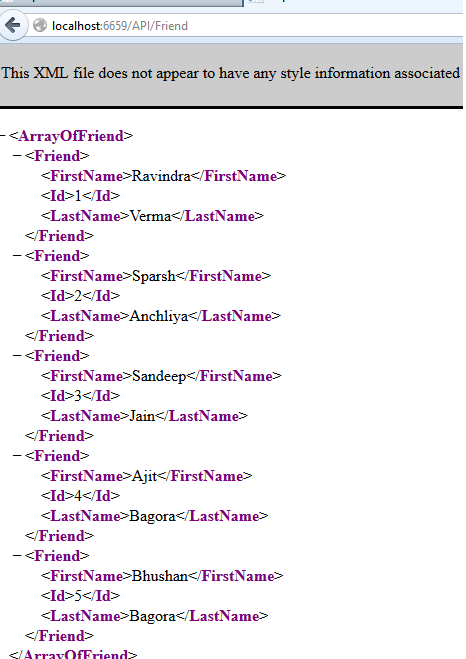 I am using SQL Server “Friends” Database in this example. Now click on Model.tt file in your new class project. Just edit the Input file as I edited in below fix you need to give your EDMX Path. Step 7:- Once the file is generated you are good to go just see as I got the files in separate class project. I hope you will achieve the same with above steps. How to create Web API ? We have discussed what is Web API. 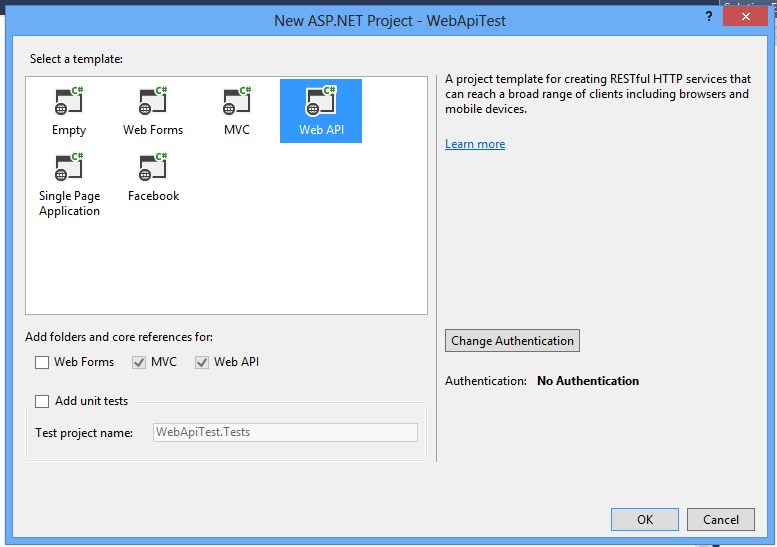 Now in this article we will see how to create web API. So with out wasting much time lets start visual studio (In my case I am running VS 2013 web express). 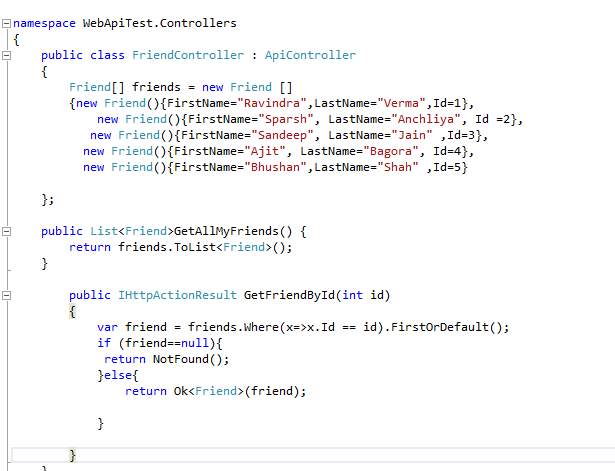 So in my example I am creating a web API project for Friends. this API should return either all the friends or specific friend according to Id so lets start. Step 1: Create a new web project when you click on web project you will get following option. Select Web API option as shown in below screen shot. 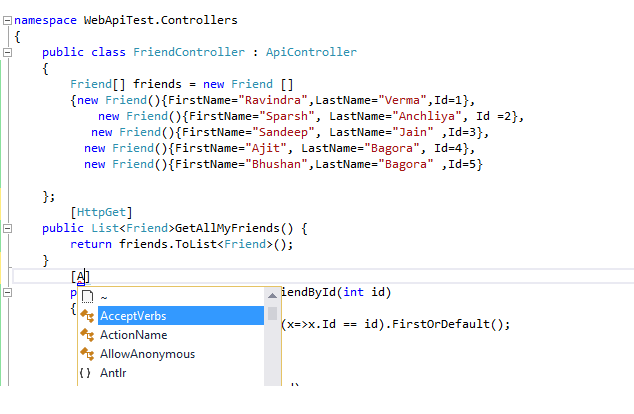 things to remember here the name of controller class will be use later on in your API URL so select the name properly and the controller class name should followed by controller. Step 4:- Now remember all the coding part need to be done here . 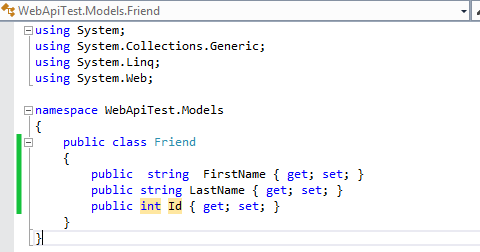 I am creating two method here one method with name “GetAllFriends” and “GetFriendById”. So as name suggest one will return list of all friends and one will return particular friend for a given id. If you see below instead of fetching data from database I have created a array of friends as shown. Now in above fig you saw two method with different return type. Now concentrate on GetFriendByID It’s return type is HttpActionResult. so if you see below in that particular method the return type is OK which means status code 200. 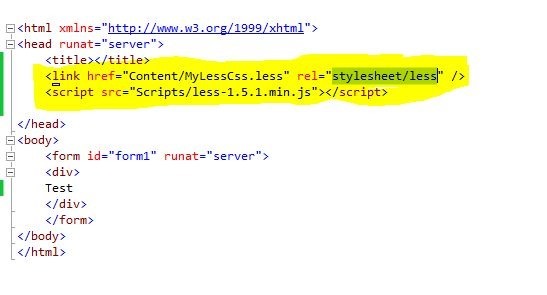 It means http response will be return in this method. Now another interesting part is you can add different attribute with method like HTTPGET, HTTPPOST,HTTPDELETE etc Just see in below screen shot as shown below. 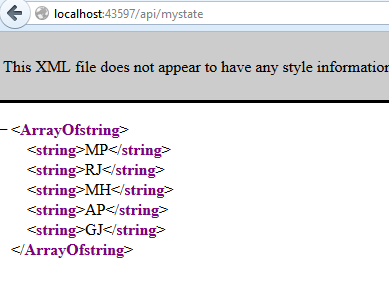 I hope you understand how easy to create Web API. Now in next step we will learn how to consume the Web API. 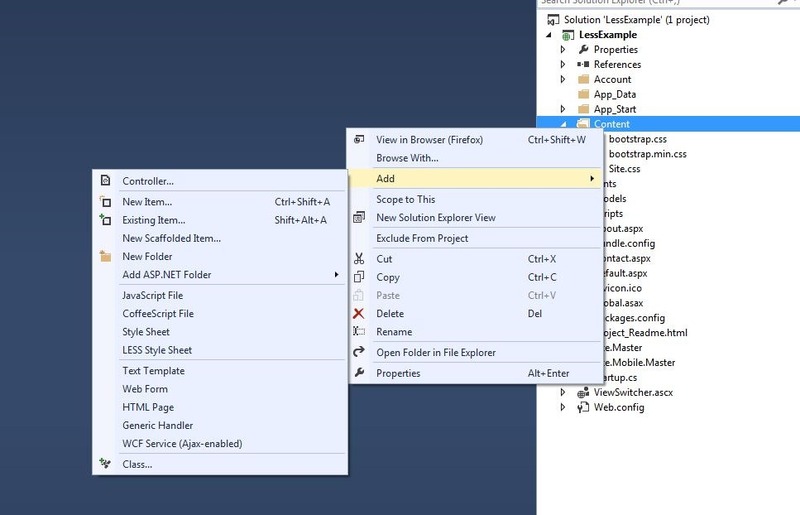 Mean while you can create different web api. 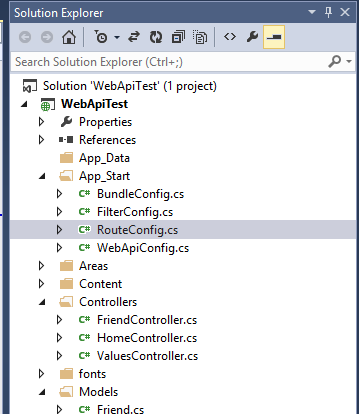 What is Web API ? HTTP is simple way to connect broad range of clients, including browser, mobile & desktop application. To achieve above broad range a new framework is introduce on top of .NET framework which is called ASP.NET web API. With ASP.NET Web API you can call simple RESTFul service. You can perform various GET, PUT, POST, DELETE operation using Web API. 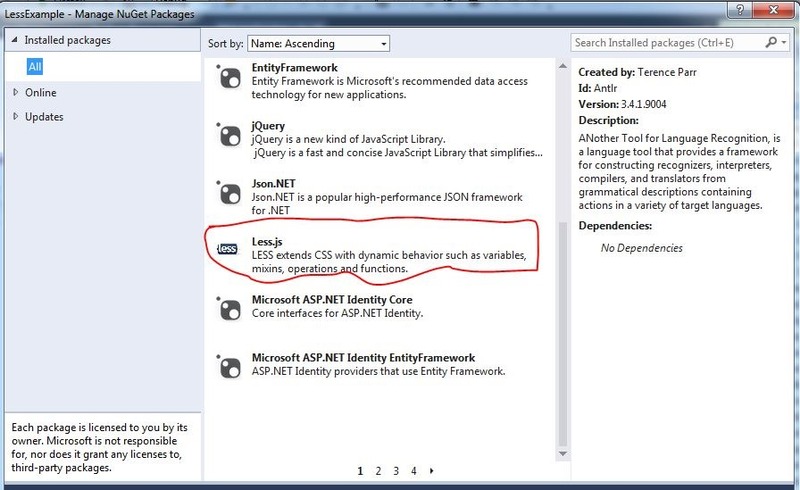 Web API is enable to service data request from client in both (JASON /XML) format according to client need. 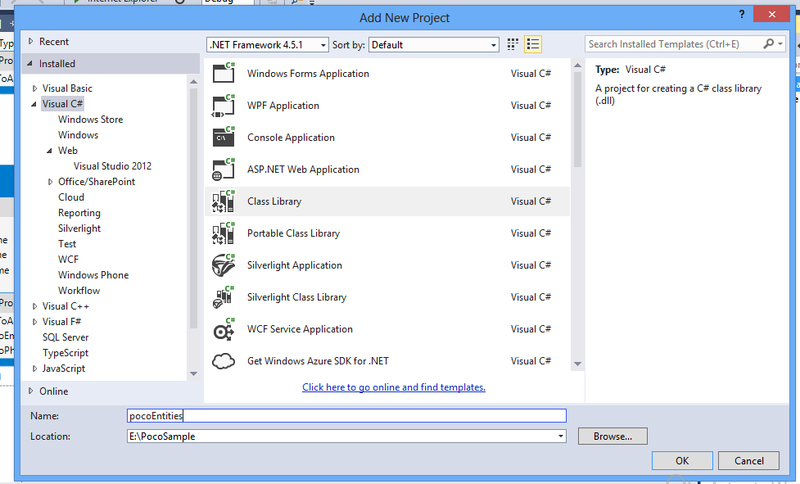 Web API introduced with ASP.NET MVC framework in later stage. 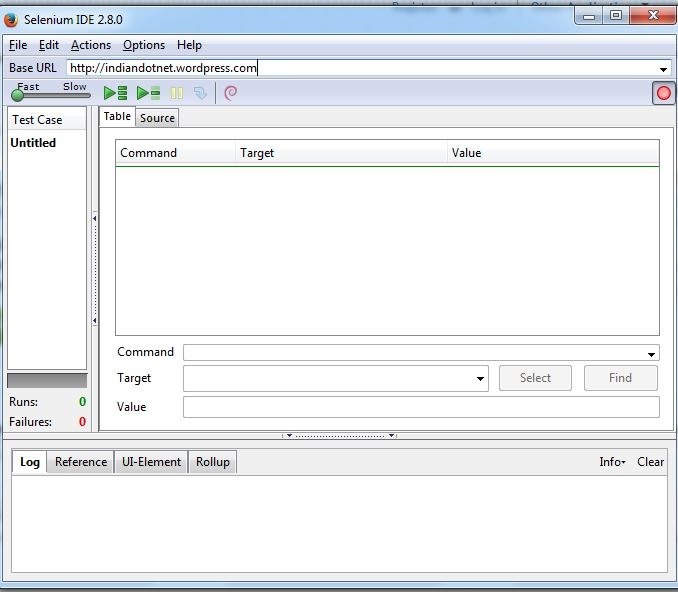 If you are familiar with MVC application then you will think it is same. You can easily host web API in IIS same as you host a web site. I hope now we have a basic understanding of Web API. In next topic we will discuss How to implement Web API.